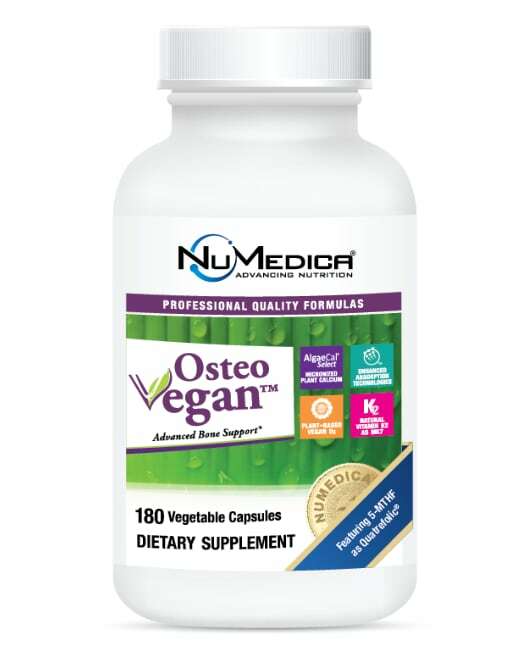 NuMedica Osteo Vegan Rx is a Highly Advanced formula that features professional-grade, plant-sourced calcium to enhance bone building. This natural supplement contains certified organic whole-food calcium complex that includes more than 70 trace minerals and beneficial plant-based nutrients. Plant calcium has been proven in clinical studies to help increase bone density. If you are concerned about bone density-as most of us are as we age-you can benefit from a bone-building supplement like this one. Since the calcium in this formula is an all-natural, GRAS certified, plant-derived whole food, it does not have the potential negative effects on arterial calcification that non-food based calcium supplements have. NuMedica Osteo Vegan Rx contains plant calcium, which has been proven in human clinical trials to increase bone density by 4.33%. Improved bone density can translate into stronger bones that are less susceptible to fractures and breaks. Did you know that the best way to infuse calcium in your diet is through leafy greens and legumes and not dairy? This makes this supplement's plant-based calcium a popular choice for anyone who wants to strengthen bones and ward off conditions like osteoporosis. While NuMedica Osteo Vegan Rx contains a highly effective calcium formula, it also includes D3 to ensure that the calcium is optimally absorbed by the body. This formula contains plant-based D3, which has been clinically proven to enhance calcium absorption, making this vegan-friendly supplement an excellent support for bone density and health. Moreover, NuMedica Osteo Vegan Rx also contains a broad spectrum of minerals and nutrients that support bone health as well. Take three capsules with breakfast and three capsules with lunch, or as directed by your healthcare practitioner. ‡Quatrefolic® 5-MTHF is trademarked by Gnosis S.p.A. Patent No. 7,947,662. AlgaeCal® Select micronized plant calcium certified organic, GRAS, patent pending.